A hybrid bike is a combination of a standard road bike and a mountain bike. Hybrid bikes were created so that you can use the same bike for commuting or recreation in a city setting. You can use the same bike on the sidewalk or on asphalt-paved roads, as well as going on more difficult terrain. If you don't intend to use your bike for racing (there are specially designed sport bikes for that), then maybe a hybrid bike is a reasonable option. But there is a wide variety even among hybrid bikes. Here is a guide to some of the best hybrid bikes on the market. Schwinn—was founded by the German-born Hermann Schwinn in 1895, in Chicago, Illinois. 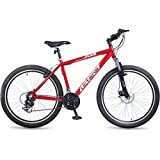 The company is a well-known manufacturer of bicycles, making cruisers, mountain bikes, hybrid bikes, urban and bike path bikes, and bikes for children. They are presently merged with Pacific Cycle, Inc.
Critical Cycles-- is a company based near Los Angeles, California. They manufacture bikes for commuting, leisure, and exercise riding. Vilano Bikes—is a bicycle company located in St. Augustine, Florida. 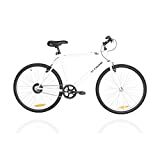 They make a wide range of bicycles: fixed gear, road, hybrid, folding and mountain bikes, as well as children's bikes. They also have detailed tutorials on bicycle construction, maintenance and alteration. Northwood Cycles—is a family business that was established in 1924 by E.L. Boxall, and is based in Northwood, Middlesex, England. They make a very wide range of bicycles: racer, hybrid, road, mountain, touring, tandem, folding and children's bikes. 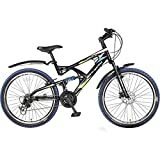 They are also retailers of many other major brands of bikes. Cross Bike: This type of bike has a frame like a racing bike, but has flat handlebars, so that the rider sits upright (rather than crouched over, like a racer). They don't usually have the trekking bike features of fenders, lights, carrier racks or panniers. Commuter (or Urban) Bike: This type of bike is mainly for commuting in an urban environment. It has the accessories of the trekking bike (panniers, fenders, carrier rack, head and rear lights), but the wheels will be more adapted for urban use (not for uneven rocky or unpaved surfaces). They usually have chainguards, so that a person will not get their clothing caught in the moving chains. City Bike: This is like the commuter bike, but also is equipped for traveling over the types of obstacles you would encounter in the big city: potholes, sewer grates, broken glass. Comfort Bike: These are a slower, heavier type of hybrid bike. They were meant to be a downgrade from the mountain bike. They have the same wheel size, brake and gear system as a mountain bike, but have a number of features that make it comfortable for the rider to sit upright. Thickness of the tire: People note that narrow tires allow you to ride faster. Keep that in mind if you'll be riding on the highway, and you'll have to ride quickly to stay with the traffic. Terrain: You can settle for a simple construction if you will be mostly on paved roads and sidewalks. But if you will be going on rough surfaces, you may want a bike frame with a suspension fork. The suspension fork are springs that bounce when you hit a pothole or rock. They allow for a smoother ride. Derailleur gearing, where the chain moves from one sprocket (the spoked cog wheel that rotates the chain of the bike) to another when changing gears. This may be enclosed in a chainguard, that protects the rider from getting clothing caught in the rotating chain while riding. Internal gearing, where there is an enclosed hub on the rear wheel that contains a system of planetary gears (=interlocking gear wheels, like in a watch). This is typically heavier, more expensive, and with fewer speeds than the derailleur gearing, but has the advantage in that the gears are protected from mud and rain inside the hub. You also can change gears even when you are not traveling—like when you're stopped at a red light, or in traffic. 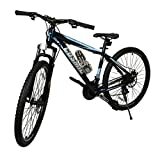 Hybrid bikes can use one or the other type of gearing system, or even both, depending on the intended use of the bike. Tires: There is a standard 700c tire for hybrid bikes, which is 28”-29” in diameter. These are better on accelerating and ascending on pavement. Ask about the width and tread of the wheel, for what type of use you have in mind. Carbon-fiber/carbon-aluminum mix, which is more light, strong, and corrosion resistant. Linear (direct-pull) brakes—also called “hub brakes”: These brakes are more durable, but not made for extreme weather conditions. These are adequate for casual riding and commuting. Disc brakes:they brake better when going downhill, or in muddy conditions. Seats: We've already noted that most hybrid bikes are modified to make it easier to sit upright, which is usually more comfortable. Take note that some bike seats are ergonomic (= designed for comfort). They'll be specially molded and padded to prevent you from feeling numbness or pain.